Today, I'm thrilled to announce the official launch of the Hundred Hole Hike, a charitable golf event that hopes to build on the success of last year's Ben Cox 155. Instead of one golfer walking a bunch of holes in one day for one cause, the HHH is a global network of passionated golfers all walking 100+ holes in a day for a variety of worthwhile causes. Our website, http://www.hundredholehike.com/ is now live and serves as a centralized platform for "hikers" to share their progress and their story through blogging or other social media tools. Our goal is that http://www.hundredholehike.com/ evolves into a real community of avid golfers who share a passion for the game and for helping others. Please click here to see my opening blog post and check out the press release below for more information. I couldn't be more excited about the launch of this event and some of the exciting things we have in the hopper for this year and beyond. I hope you'll join me by pledging your support or perhaps joining us as a hiker this summer. 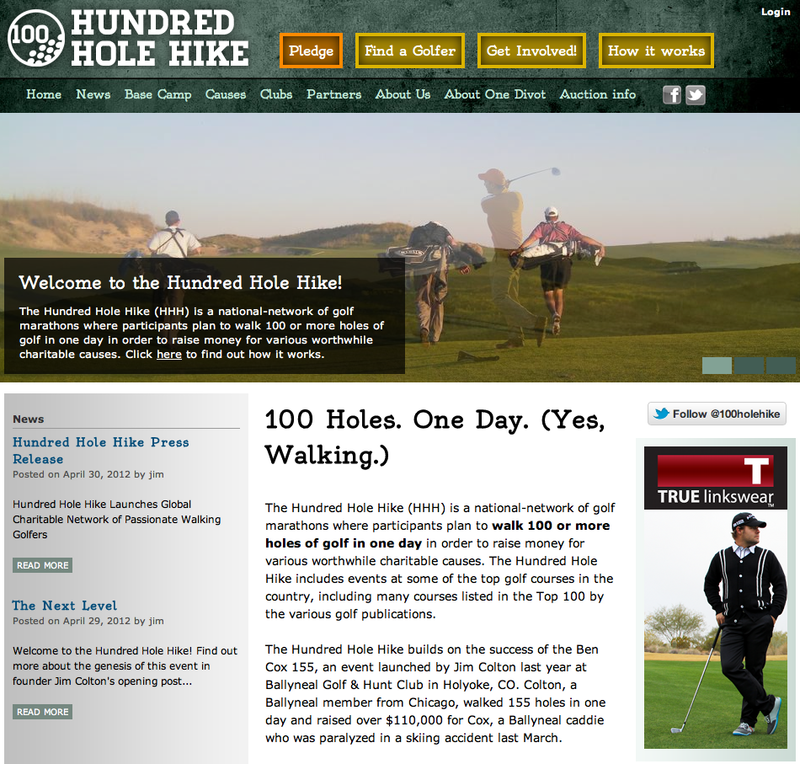 (Chicago, Illinois) – One Divot – a charity founded by 2011 Walking Golfer of the Year Jim Colton – announces the launch of Hundred Hole Hike (HHH), a giving platform hosted at www.hundredholehike.comthat supports fundraising efforts of “golf marathoners” who will play and walk at least 100 holes in one day to benefit philanthropic causes. A society of dedicated men and women seeking to use their passion for the game as a vehicle to better the lives of others, HHH allows for each hiker to choose their own causes to support. Among the roster of industry leaders to register are Rob Rigg of TRUE linkswear and John Ashworth of LINKSOUL. Also participating are renowned venues such as Ballyneal Golf & Hunt Club, The Kingsley Club and Hidden Creek Golf Club. A Ballyneal member, Colton’s original goal was to walk 108 holes and raise $5,000 to benefit Cox. On June 23, 2011, he walked 155 holes and raised more than $110,000. Soon after, he set about forming One Divot and creating a method for like-minded golfers to raise awareness and money for the charities about which they care most deeply. 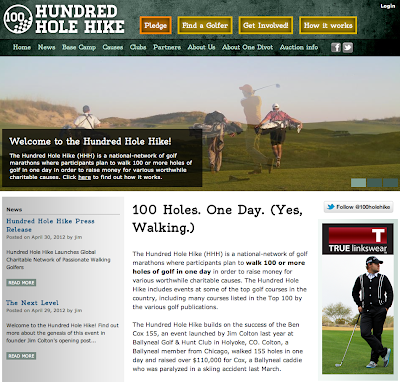 More than just a robust and centralized venue for pledge collection, www.hundredholehike.com is designed to be a daily web destination for avid walking golfers. It will include personalized blogs where HHH participants share updates on training, engage in friendly competition with other hikers and post items pertinent to those who embrace the game’s traditions and philanthropic heritage. For additional information visit www.hundredholehike.com/how-it-works or follow @100HoleHike on Twitter.